Mountain pepper (Tasmannia lanceolata) is a native species endemic to slopes and gullies of wet tall open forest or temperate rainforest of Tasmania, Victoria and south east New South Wales. Typically, mountain pepper grows as an upright bushy shrub or small tree, 1.5–4m tall. The plant has smooth reddish stems and shiny dark green leaves that are aromatic and have a peppery flavour. The mountain pepper produces glossy black, round, furrowed fruit during summer. The leaves and berries of the plant are spicy and aromatic, and products derived from both plant parts can be used for culinary, preservative and potentially medicinal purposes. The leaf may be used fresh as an ingredient or garnish. Most of the harvested leaf is dried and milled for use as a spice and flavouring. The fruit may be used fresh or dried, with dried whole berries used as an alternative to conventional pepper. The extract of leaves can be used as flavouring, food preservative or a therapeutic ingredient. The market demand for mountain pepper is currently met by a combination of ‘wild harvest’ and from cultivated plantations. The production of mountain pepper is a small and developing industry within the developing native foods industry. The Australian Native Food & Botanicals (ANFAB) is the peak body for the Australian native food industry. Accurate information is not readily available for the native foods industry but a stocktake of the industry published in 2012 provides good estimates of industry characteristics, production figures and product value. Mountain pepper production enterprises range from hobbyists with few overheads to a small number of producers, who have established small plantations of up to 1ha (about 3,500 trees) or rely on natural regrowth on their own properties for a secure source of supply. Most enterprises, however, source raw material from wild trees (of which a significant proportion is regrowth trees), under licence from state forestry organisations, and wild harvest accounts for 90% of product on the market. There are no businesses relying on mountain pepper for their total farm income. The more serious producers may earn up to 60% of their income from mountain pepper. Mountain pepper harvesting and growing is estimated to employ between 20 and 30 individuals, including enterprise owner–operators, across the whole industry. In addition to growing mountain pepper, producers were also likely to have other native food crops and horticultural food crops in their enterprise mix. The leaf, leaf extract and berry of mountain pepper are used in a wide range of applications, predominantly culinary but also as a food preservative and a therapeutic ingredient. The fresh leaves of mountain pepper are suitable for use as a fresh herb, garnish or in the manufacture of pastes and purees. Dried leaf is used as flakes but mostly milled for use as a spicy ingredient in flour mixes, relishes, sauces, mustards, soups, stews, smallgoods, cheeses and flavoured pasta. The whole dried berry is often used as an alternative to conventional whole pepper as a table condiment. Sharing similar taste and flavour characteristics, the milled dried berry may have similar applications to milled leaf. Freeze-dried berries contain a strong red dye, which adds colour to food, and it can be rehydrated to be used as a garnish. Lanceolata extract, prepared by solvent extraction of the leaf, is added to products as diverse as olive oils, cheeses, smallgoods and confectionary. The extract has a spicy aroma, with hints of cinnamon and a delayed and persistent heat on the palate. A number of research projects have been conducted to understand and investigate the properties of mountain pepper, and other native foods, including extract quality stabilisation and registration, health benefits and health-enhancing compounds in native foods, physiological activities of native foods, nutritional data, functional properties and defining the flavours of native foods. 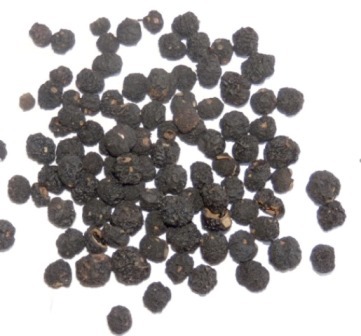 A primary ingredient of the plant, polygodial, gives mountain pepper useful functional properties, such as very strong antimicrobial activity against common food-borne human pathogens, common food spoilage bacteria, yeasts and moulds, indicating potential for use as a natural food preservative. The compound also has insect anti-feeding properties. Mountain pepper berry has also been shown to have significant antioxidant activity for humans and veterinary purposes. Mountain pepper is predominantly sourced from the wild harvest of naturally growing trees. In a forest community, mountain pepper is an early coloniser of disturbed sites. 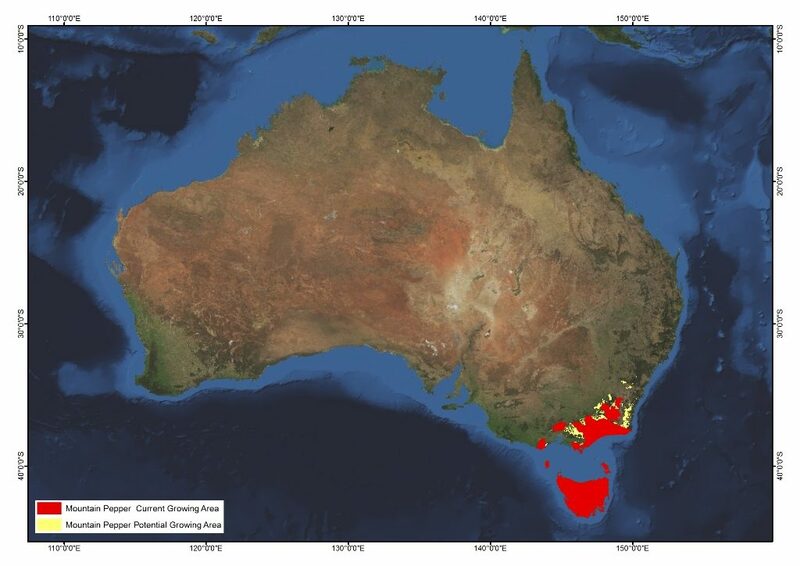 The natural distribution of the species takes in a significant part of Tasmania, and the cool temperate regions associated with the Great Dividing Range in Victoria and southern New South Wales. Typically, the tree grows at altitudes between 300 and 1,400 metres. Mountain pepper prefers moist, fertile soils and it has evolved in a forest environment across a range of soil types and textures. Being a rainforest plant, mountain pepper has limited ability to extract water from drying soils, so water holding capacity is an important soil characteristic but equally so, good drainage is essential. Under cultivation it is expected that mountain pepper would perform best on well-drained soils of sandy loam through to light clay texture. The mountain pepper tree is found in the cool wet temperate highland regions of mainland Australia and Tasmania. 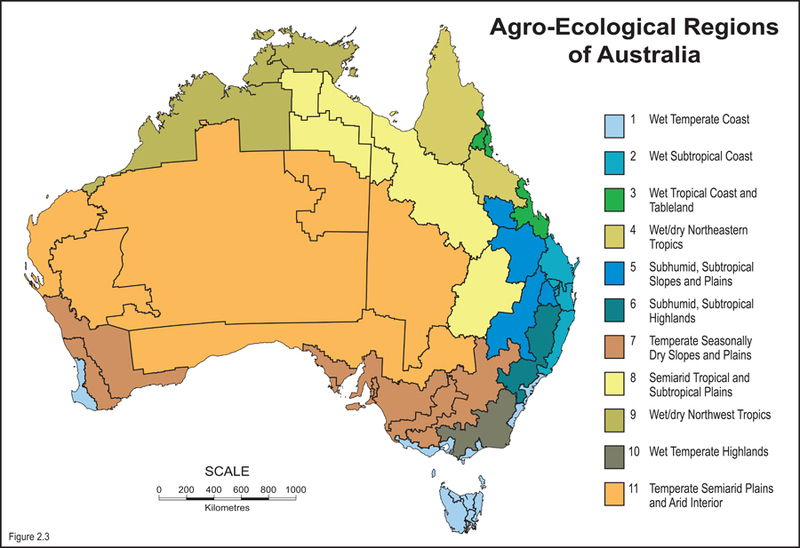 Its productive capacity is best in regions where annual rainfall exceeds 1,000 millimetres in cool, sheltered environments, free of water stress. Summer rainfall is important to maintain moist soils and water supply; and in cultivation, irrigation may be required to supplement summer rainfall. The natural environment of mountain pepper means that it has the ability to withstand frost, however late frost in November or December may burn newly emerged shoots but the effect is slight and temporary. The tree is unable to cope with the extreme water demand of hot windy days. The plant appears to be unable to regulate its transpiration in such conditions and will die, even if additional water is supplied. Therefore sheltered growing sites are necessary. There are no registered varieties or cultivars of mountain pepper for commercial production. However, several producers have identified individual trees with characteristics suited to their production location or practices, and it is likely that this type of selection will continue in the future. 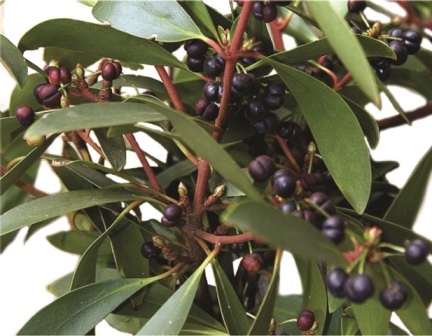 There is a small market for mountain pepper as an ornamental shrub, therefore plants are available from many native plant specialist nurseries in south east Australia. However, it is probably a better investment to choose stock of known provenance, and engage a contract or specialist propagator to produce seedlings for plantation establishment. The site of a mountain pepper plantation should have soils that are well-drained, fertile and soil pH in the neutral to slightly acid range. Weed control at establishment is essential, to reduce competition for light, nutrients and water. Protection from browsing animals should be considered. The site itself should be protected from hot winds or alternatively a mixed planting should be considered, where mountain pepper is protected by a larger tree in the planting. Plantations are established using rooted cuttings from trees of good form, productivity or other sought after characteristics. 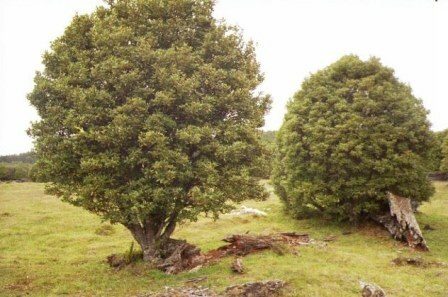 Establishment by cuttings provides a plantation of trees of uniform characteristics, compared with trees established from seed, which can be more varied. Further, seed germination can take up to 12 months and seedlings are small and slow to establish. A suggested planting density is rows spaced at 3m with plants about 800mm apart within the rows. This would allow machinery access between the rows and potentially machine harvesting once developed. 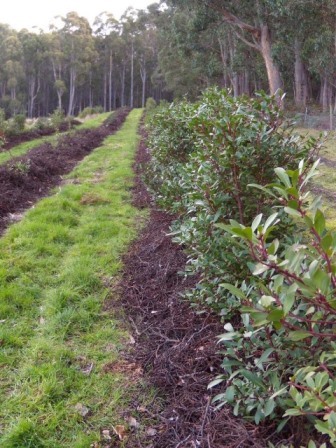 Experience to date is that mountain pepper responds well to nitrogen fertiliser applications but more needs to be learnt about long-term nutritional management of a plantation. Irrigation is required where natural summer rainfall cannot be relied upon, especially to offer some measure of protection against serious damage to new foliage and shoots in warm windy weather. Use of soil moisture monitoring equipment will greatly assist understanding water supply to the plant. In ideal situations, well-selected stock will yield fruit and limited quantities of leaf within two to three years of establishment; and a tree at five years old should sustainably produce about three kilograms of fresh leaf and 1.5kg of fresh berries. The mature yield will be heavily influenced by the extent to which the tree is allowed to develop a canopy before the harvest of leaf material commences. Weed growth should be managed at establishment and throughout the early years of the plantation to minimise competition by weeds for light, nutrients and moisture. The leaves of mountain pepper contain a compound that is anti-fungal and deters ants, however there are several insects that affect the tree in the wild. Leaf miners and leaf rollers consume the leaf, while a tiny grub can be found in the fruit and seed. While the plant is free of severe infestations in the wild, the influence of a plantation environment is not understood. As at 2013, there was no empirical evidence to suggest that pests and diseases will pose a significant issue for plantation production of mountain pepper. Further, the market preference and the industry’s intention is to produce mountain pepper products without the use of chemicals during production and to potentially offer an organic product, so no chemical treatments for pests and diseases is envisaged. Mountain pepper berries are picked by hand. In the future, it is hoped that equipment based on horticultural tree shakers may be able to be adapted for plantation harvest. Leaf material is either plucked from the plant or gathered using simple pruning equipment. A shed with benches or tables is required for removing twigs and unwanted plant material from the harvested berries and leaves. If the enterprise is to include processing, drying and milling equipment will be required. Storage facilities will be required to provide a cool, clean, dry, dark and insect-proof environment for dried and milled product. Leaves of the mountain pepper plant are best harvested between February and the onset of flowering (about late September), while berries are ready for harvest from March to May. The leaves may be harvested manually or using handheld pruning equipment; though the establishment of plantations may lead to developments for greater mechanisation of harvest. Berries are manually picked from the trees, but in plantations there is potential for the use of tree shakers. For both wild harvest and plantation harvest, it is important that enough foliage is left on the tree to ensure good recovery of the plant and good production the following season. With berry harvest, a considerable proportion of fruit is also left on the tree. A small amount of the harvested leaf and fruit may be marketed as fresh product, with fresh berries maintaining good quality when stored at 1–2°C for several weeks. The berries may also be freeze dried, which maintains the intense colour and flavour of the fruit, and the product reconstitutes well. The bulk of harvested material is dried using fans and warm air (30–45°C), with the aim of removing moisture to prevent the development of yeasts and mould, and to maintain colour and flavour. After drying, the leaves are removed from the stems and sorted for later processing into leaf flakes or ground powder. 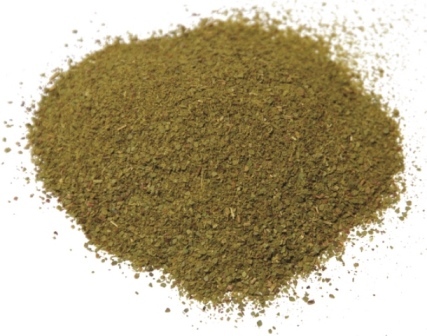 Powdered dry leaf may also be processed to yield an extract. The dried berries are cleaned and packed for storage or further processed to produce crushed or finely ground product. Product quality is maintained by storage in a cool, clean, dry, dark and insect-proof environment. As the market matures, product quality and traceability is increasingly important, with a batch sampling system and microbiological testing for each batch conducted by leading producers. The markets for growers and harvesters of mountain pepper are varied. Producers may choose to sell their raw products to aggregators, who in turn clean, dry, process and market the end products; or they may undertake these processes themselves and value-add their own product. Customers of processed product are increasingly demanding proof of safe production and processing systems. The key markets for mountain pepper are domestic for leaf and berry in fresh and dried, whole and milled forms; food manufacturers for milled leaf; gourmet value-added retail products; online for ingredient and value-added product; and export for the gourmet food ingredient sector, especially into Europe. An estimated 10-15% of pepper leaf production and 60% of pepper berry output is exported, with the key markets including Germany, France and Switzerland. Export of pepper leaf in particular, is considered a market opportunity still to be maximised. The 2012 industry stocktake described the market for mountain pepper as oversupplied, and that investment in infrastructure by current market participants and identification of additional product source has outstripped market development. The existing drying and processing infrastructure could handle double the current output of product. A challenge to all participants in a relatively new industry such as mountain pepper is having the ability to adapt and innovate. Much trial and error is involved in determining the management systems to take a plant from the wild and cultivate it for regular yield and consistent product quality. The volume of available wild-sourced product is highly variable and the natural variation of production and the influence of seasonal conditions is not well understood. Good inventory management is required to ensure a constant market supply. Product quality or reputation is potentially jeopardised by unlicensed wild harvesters not harvesting according to sustainable practices. Some operators are implementing quality control programs to demonstrate the sustainability and quality of their product. Market growth is limited by a lack of market development, and the education and awareness within the food industry and general public of mountain pepper, its uses and benefits. Wild harvest of mountain pepper leaves and berry requires a licence from state government forestry departments or similar agencies. Mountain pepper is classified by Food Standards Australia New Zealand (FSANZ) as a traditional food of Australia and it is included in the FSANZ nutrient tables. Mountain pepper is accepted by the European Union as a condiment pepper, and as such is listed under the Codex Alimentarius system, which is required to import food products into Europe. Certification by organisations such as Freshcare and HACCP may be required to sell product to supermarkets, major retailers and food service industries. Prospective growers should speak with potential customers to fully understand any product certification requirements. When processing any raw product and value-adding, consideration should be given to food standards regulations, as administered by FSANZ and set out in Chapter 3 of its Food Standards Code.